BBQ Pork Chops is exactly what you’ve been craving. There are lots of fun ways to move more! You don't have to be a member to do the 2 for 2! So you’re looking to lose weight and need some easy places to cut calories. What about skipping breakfast? It turns out that eating a healthy breakfast and achieving sustained weight loss are inextricably linked. The National Weight Control Registry has been tracking the eating and lifestyle habits of about 3000 people, all of whom have maintained a 30-pound (or more) weight loss for at least a year (some have been participating for as many as six years). The researchers tracking these studies found that 78 percent reported eating breakfast every day, and almost 90 percent reported eating breakfast at least five days a week. But why does breakfast help with weight loss? One of the primary reasons breakfast is so effective may be as simple as reducing hunger later in the day. By eating breakfast, you stock up on (hopefully!) healthy fuels which reduces your hunger as the day progresses. This can certainly help prevent overeating in general, and may also help by avoiding times when you snack on the go, for example by purchasing food at vending machines or gas stations, where healthier choices are harder to make. But it’s not just about reducing temptation. There’s also a physiological response that happens when you skip breakfast. The type of prolonged fasting that occurs when you skip out on that first meal of the day can increase your body's insulin response, which in turn increases fat storage and weight gain. So it may sound counterintuitive, but going without this vital meal can actually increase your risk of obesity. Eating breakfast right can be a great way to get you on track and set the tone for making healthy choices all day. When you eat a breakfast based on whole grains, healthy proteins and fruits, you tend to eat a healthier overall diet, one that is more nutritious and lower in fat. When you skip breakfast, you're more likely to skip fruits and vegetables the rest of the day, too. Breakfast is the perfect meal to start adding whole foods into your daily meal plan. Eating breakfast also gives you energy, which increases your ability and desire to undertake physical activity during the day. A healthy breakfast refuels your body and replenishes the glycogen stores that supply your muscles with immediate energy, meaning you are more likely to go for that run, take a walk or simply go about your daily business and get things done. Conversely, skipping breakfast is associated with decreased physical activity. The theory is all well and good, of course, but many people who don’t eat breakfast aren’t really skipping it as a conscious decision. They are simply having a hard time fitting it into their busy lives. Likewise, many people who aren’t eating the healthiest of breakfasts aren’t necessarily deciding that nutrition doesn’t matter — they’re simply finding that the go-to convenience foods are easier rely on and/or they don’t realize there are better options available. Put smoothie ingredients into individual baggies. Make healthy muffins ahead of time. Consider healthy crock pot recipes like steel cut oats that can be ready for you by the morning. Finding the idea of a complete meal overwhelming? Well, it’s important to remember that something is better than nothing. Start by eating a cup of yogurt and/or a piece of fruit, then as you get used to making time for breakfast, add more foods and food options slowly. Get up 10 minutes earlier than you normally would so you will have time to eat and enjoy your food. Why not make it a treat — read the paper, listen to some music, or sit out in the yard and watch the birds? This should be a pleasure, not a chore. Pick a couple of easy breakfasts and repeat them every other day. This will eliminate having to think about what to make. You can always add more options as you get used to eating breakfast. If eating a little leftover chicken or a few spoons of cottage cheese sounds good, go for it. Who says breakfast has to be cereal, toast or pop tarts? But what is a balanced breakfast? 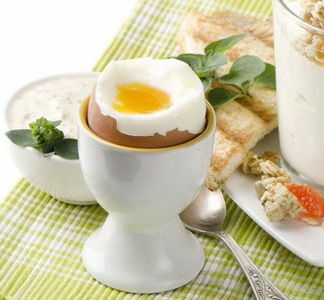 A balanced breakfast consists of three main food groups: a protein and/or a healthy fat, a fruit or veggie, and a grain. Even many convenience foods like breakfast cereals offer healthy options — just be sure to pay attention to the ingredients lists, and lean toward whole grains, fewer ingredients and lower fat, sodium and sugar content. Take it to the next level and do the 2 for 2 weeks and earn cool prizes for your eat right, move more lifestyle. Blue Cross and Blue Shield of Louisiana is an independent licensee of the Blue Cross and Blue Shield Association and incorporated as Louisiana Health Service & Indemnity Company. Copyright © 2019 Blue Cross and Blue Shield of Louisiana. Blue Cross and Blue Shield of Louisiana is licensed to sell products only in the state of Louisiana.